Stormwater can be a real detriment to your home. In a previous post, HIR gave you some great tips on dealing with potential basement leaking and flooding. You can get ahead of the game though by having a good stormwater management plan. A solid stormwater drainage design can be a huge payoff in assuring the water runoff solutions necessary to protect your home. Here are some good ideas for your stormwater management plan. Swales are areas that run along the base of a slope, either naturally occurring or created for the purpose, which serve to direct the flow of storm water. In the process, they provide an additional benefit in filtering stormwater runoff, allowing it to sink into the soil. Plants on a swale’s banks will absorb much of the water. A fast-draining soil will be an important consideration in the building of an effective swale. For heavier water loads, a backup system including a perforated pipe, set in gravel underneath, can be a great benefit. The eager DIYer can certainly build a swale. If you’re looking at a more ambitious construction, say one that is long and wide, it might be better to hire a professional. If you do so, remember to review the HIR post on hiring contractors. Remember, the objective of your swale is to carry stormwater runoff to a place where it can be safely released. A garden bed with good drainage or buried dry wells are good options. Shallow catch basins planted as flower beds, rain gardens allow water to pool during a downpour. Afterwards, it can gradually percolate through the soil. A swale is stormwater runoff highway; a rain garden is the destination at the end of the road. Rain gardens are really valuable for providing drainage off slopes that are steeper than a swale will be able to handle. It’s common to seek out a spot in your yard that is low and thus well situated to gather gravity’s boon of the stormwater runoff. However, be sure to check that the area you’re considering isn’t already soggy most of the time. If that’s the case, it may well be saturated with runoff and directing further water there would only create new kinds of problems for you. Instead, it’s better to select an area that quickly dries out. Getting your rain garden right requires some careful calculation before you dig in. However, if your strong suit is less mathematics and geometry, but more trial and error, and you have the time and patience, a little experimenting can do the trick as well. 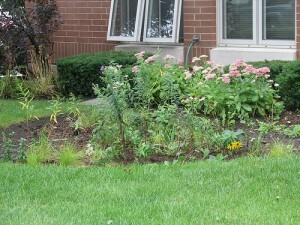 Build your rain garden and see what happens. You can certainly enlarge it as necessary. And, if it turns out that you’re not getting the desired results, rethinking the location may be necessary. Having an extra garden on the property is hardly a burden. Before you start, though, remember these ideas: locate your rain garden at least 10 feet from your house and at least four times that far from a septic system or steep slope. If you’re doing it yourself, a small (say, 5-by-10-foot) rain garden probably makes for a reason DIY excavation project. Once it gets bigger than that, you’ll need an earth-moving machine, which will likely require hiring some professionals. If you go that route, an important consideration is to ensure that the earth-moving machinery does not ride over the actual garden, but works exclusively from the edges of your proposed garden. Otherwise it could compact your soil to such a degree that the garden’s effectiveness is significantly reduced. Research which local species best tolerate wet conditions and use these to plant at the center of the garden. Surround them with plants that you know are suited to occasional standing water. Plants that prefer dry soil should cover the outer edges of your garden. Hopefully these rain water runoff solutions provide you with some good tips for some stormwater drainage design that will aid you in coming up with the most effective stormwater management plan for the needs of your home.